Remember the pilgrimage my company (JesCom) led in 2008? Well, we are doing another pilgrimage in October this year, this time in the Holy Land in Israel. 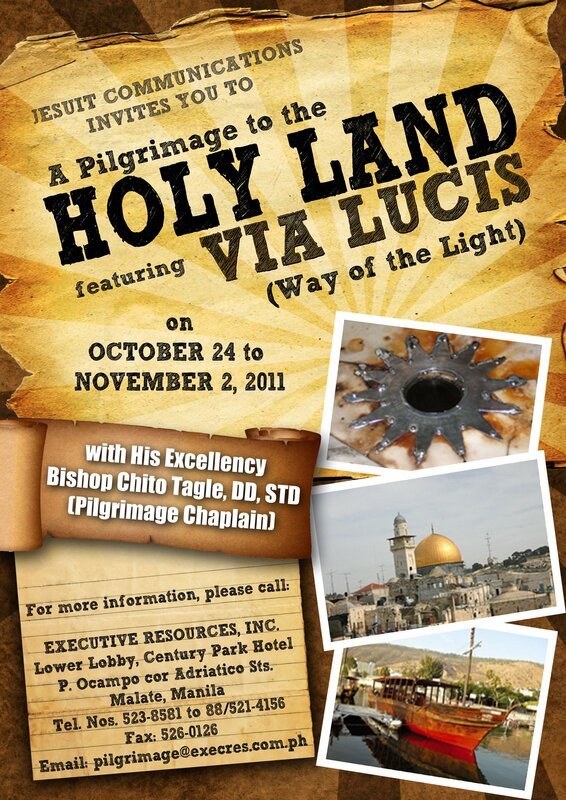 Led by His Excellency Bishop Chito Tagle, the pilgrimage will be a different take on the usual Holy Land pilgrimage as it features Via Lucis or Way of the Light. Highlights of the trip are Mount Nebo, Tiberias, Nazareth, Sepphoris, Mount Tabor, Cana, Mount Carmel, Capernaum, Sea of Galilee, Mount of Beatitudes, Jordan River, Tabgha, Jericho, Dead Sea, Qumran, Ein Karem, Bethlehem, Jerusalem and Emmaus. 24OCT (Mon). MANILA – DUBAI – AMMAN – MOUNT NEBO – SHEIKH HUSSEIN –TIBERIAS. 25OCT (Tue). TIBERIAS – NAZARETH – SEPPHORIS – MOUNT TABOR – TIBERIAS. Leave for Nazareth, the place where Jesus spent His childhood. Visit the Basilica of Annunciation, built on the site of the house of Mary and Joseph, where the Angel Gabriel appeared to Mary announcing the birth of Jesus. Visit St. Joseph’s Church, site of St. Joseph’s workshop and the dwelling place of the Holy Family. Continue to the ruins of the city of Sepphoris, located 6 km northwest of Nazareth on a hill rising above the Bet Netofah Valley. It was the administrative center of the Lower Galilee from the time of the Second Temple to the 4th century. According to an early-church tradition, it was here that Mary was born and the place her parents lived. At the foot of the ancient city, a Crusader church was built in the 12th century dedicated to Sts. Anne and Joachim, Mary’s parents. The Church is in ruins today and only the eastern wall of the sanctuary survives. 26OCT (Wed). TIBERIAS – CANA – MOUNT CARMEL – CAPERNAUM SEA OF GALILEE (Boat Ride) – TIBERIAS. Proceed to Cana, where Jesus performed miracles. His first miracle at a wedding feast, by changing water into wine; and the healing of the royal official’s son who was near death. Here, married couples will have the opportunity to renew their marriage vows at the Church of the First Miracle. On to visit Mount Carmel passing through the summit of the northern most edge of the Carmel range. Its name is derived from the Hebrew “Karem El” which means vineyards of God. Visit the Stella Maris Church of the Carmelite Monastery. Under the High Altar, one can find the Cave of Elijah, held by Christian tradition as the place where the prophet lived. 27OCT (Thu). TIBERIAS – MOUNT OF BEATITUDES –JORDAN RIVER – TABGHA -– TIBERIAS. 28OCT (Fri). TIBERIAS – JERICHO – DEAD SEA – QUMRAN – JERUSALEM. 29OCT (Sat). JERUSALEM – BETHLEHEM – JERUSALEM. Head for the picturesque hillside village of Ein Karem, meaning “the spring in the vineyard.” Visit the Church of St. John the Baptist, built on the traditional home of Zacharias and Elizabeth. Inside is the Crypt which houses the Grotto of the Benedictus, considered to be the place where John was born. Outside the Church, you will find the “Benedictus” translated in several languages. Up on the slopes of a rocky hill lies the Church of the Visitation or Church of the Magnificat, where Mary visited her cousin Elizabeth, an eventful meeting of the Mother of God and the mother of John the Precursor. In front of the Church is a wall with the “Magnificat” written in more than forty languages. Enter the Old City of Jerusalem and visit the Church of St. Anne, traditional site of the house of Mary’s parents, St. Anne and St. Joachim. Walk to the Pool of Bethesda where Jesus cured the paralytic. 01NOV (Tue). JERUSALEM – SHEIKH HUSSEIN – AMMAN – DUBAI. 02NOV (Wed). DUBAI – MANILA. In the early morning, take the connecting flight back to Manila in mid-afternoon. For more information please call Executive Resources 853-8581; 521-4156. Please tell them that you were led to them by Pinay Traveller or by JesCom.